North Korea uses the threat of missiles and nuclear weapons to press for peace talks with the US. North Korea’s midnight test-launch of an intercontinental ballistic missile that could potentially reach California and beyond, puts Washington under threat. The test triggered President Trump to castigate China and pushed South Korea into a tighter embrace with the United States. South Korea had been holding back on deployment of US THAAD missiles and calling for talks with Pyongyang, but within hours changed its stance, urging American help to strengthen its own missile capability. Such measures may be emotionally satisfying, but are no match to the North Korean challenge. The missile launched on July 28, in engine power and precision navigational system, represents dramatic improvement over the first ICBM tested more than three weeks earlier – already capable of hitting the West Coast of the United States. South Korean analysts warn that North Korea will soon produce an improved model capable of hitting all parts of the United States. Kim Jong Un is confident of already achieving that goal. “Our missiles can now hit anywhere in the US and at any time,” he boasted shortly after the launch. North Korean television clips showed him tensely watching the launch-pad from an underground bunker, then bursting into delight once it had soared. The launch was timed so that news would reach Washington in daylight hours. Even the launch site was chosen for maximum geopolitical impact with the missile fired from a site in Mupyongni munitions area near China. The implication: The United States would risk hitting Chinese territory in the event it decides to attack the site. Such threats over Twitter notwithstanding, North Korea’s latest launch poses an acute dilemma to Seoul and Washington, which must reevaluate past policies of relying on China’s help to restrain Pyongyang. With China making only perfunctory steps to force the Kim regime to desist from a dangerous course of confrontation, essentially refusing to help Washington in keeping Kim under control, Trump must find new ways to deal with the North. While any military response would have catastrophic consequences for the Peninsula, talking with North Korea and acceptance of its nuclear-weapon status are unthinkable for Trump who opposed similar status for Iran. The North Korean challenge presents a quandary for South Korea’s new center-left President Moon Jae-in. Moon came to office in May, vowing to seek dialogue and peaceful exchanges, more or less a resumption of the old “Sunshine Policy” tried unsuccessfully by predecessors. Visiting Washington in June to meet with Trump, Moon proposed retaking the driver’s seat on the North Korean issue, saying he would explore the possibility of reopening talks with Kim. That initiative now lays in tatters before even starting. Moon is forced to change course; not only does he propose stand-alone sanctions on the Pyongyang regime, he’s asking Washington to modify current bilateral guidelines on South Korea’s missile technology, so that he can increase the missile payload from 500 kilograms to a 1-ton level. Defense experts suggest this would improve the chances of South Korean missiles penetrating underground military facilities in the North concealing missiles and aircrafts. Moon is also asking the US to provide bunker-busting missiles that can destroy some of 7,000 underground bunkers scattered across North Korea. While all this will strengthen Seoul’s deterrence capability, Kim is unlikely to slow the pace of his missile-assisted propaganda efforts calling for opening of “peace talks” with the United States. His campaign to replace the current armistice agreement with a permanent “peace treaty” has won support from Beijing and Moscow. China’s foreign minister Wang Yi in March officially endorsed what he described as a “double freeze” proposal, under which Pyongyang would “freeze” its nuclear program in exchange for Seoul and Washington stopping annual military exercises “in and around the Korean peninsula.” Neither Seoul nor Washington is keen to take up this proposal for the obvious reason that it does not offer “denuclearization” or a “missile moratorium.” North Korean state media make it clear that under no circumstances would the nation give up its nuclear weapons, citing the fate of Libya’s Gaddafi and Iraq’s Hussein who “could not avoid facing doom” after giving up their nuclear weapons. Besides, Wang’s proposal calling for ending “military exercises in and around the Korean peninsula” would imply limiting exercises by US allies in the region including Japan. That would ultimately benefit Beijing and Pyongyang at the risk of restricting US military alliances with Tokyo and Seoul. For that matter, Seoul and Washington are not interested in a proposal for replacing the current armistice with a permanent peace treaty under terms set by the North. This would exclude South Korea’s participation on the grounds that Seoul was not a signatory to the 1953 Korean Armistice Agreement. On his part, Kim is unlikely to give up calling for a peace conference. For him, withdrawal of US troops is an unwavering commitment on which the regime bases the reason of its existence. Moreover the North Korean leadership has never quite abandoned the cardinal aim of reunification under Pyongyang’s terms. Indeed, given the total dedication of economic resources to nuclear arms and missiles, at the expense of starving millions of its populace, the regime hasn’t essentially changed its course of achieving reunification along South Vietnamese model of swift conquest in the absence of US forces. With the option of meaningful negotiations practically closed for the time being, US and South Korean policymakers focus on maintaining the strategy of keeping Pyongyang isolated and tightly sanctioned. After unsuccessfully depending on China to help restrain the North, the Trump administration is mulling over declaring a red line beyond which the North’s provocation would not be tolerated. Abandoning its dovish stance, South Korean government welcomes newly passed legislation applying punitive sanctions and “secondary boycotts” on all countries, officials, banks and businesses that do deals with North Korea. With the economic screw expected to tighten in the months ahead, US and South Korean forces on the ground are strengthening their preparedness, unveiling a new strategy of responding to every new missile launch from North with a counter launching by US and South Korean tactical missiles. 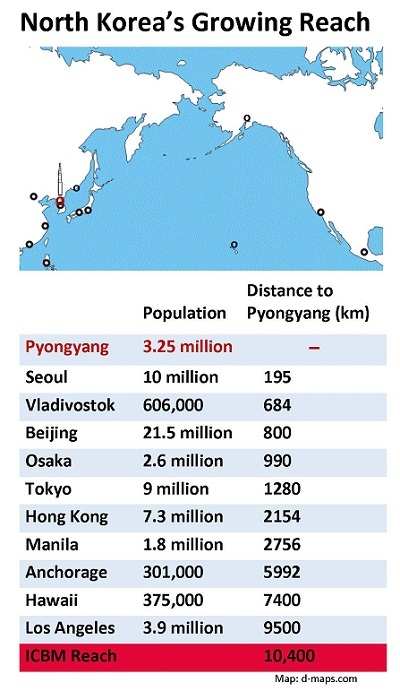 Pyongyang has lived dangerously for too long to be deterred by such threats, especially as China, worried about a North Korean collapse and a US-backed Korean regime on its border, sticks by its side. Any optimism expressed by the US and South Korean presidents for dealing with Beijing and Pyongyang is unfounded, and the moment of truth is approaching fast.